Slideshows are some of the most underestimated and under-used content verticals used on the web. By now, everyone knows the importance of images and videos along with textual content on their website/blog. But slideshows are still taking the back seat to other forms of content. However, there are some great slide sharing websites, such as SlideShare that you can make use of to drive some traffic to your blog. Who says you can get search traffic by just optimizing your own blog? If you're smart enough, you can use well optimized sites like SlideShare to get your slides into search results, and hence drive some secondary traffic to your own website! Part 2: Find out how we made over 10,000 Views on SlideShare! Can your slides get into search results? What most people don't realize is, they can use the good reputation of other websites to generate a lot of traffic to their great content. There are hundreds of thousands of people looking for slides on one topic or another at any given time. If you can create a great slideshow that can be useful for many people, then not only can you drive referral traffic from SlideShare itself, you can also capitalize on the good reputation and ranking of SlideShare to get your slideshow into search results. For example, if you search Google for the keyword "marketing for startups", you'll come across a great slideshow by John Webb right on the first page of search results! Now bearing in mind that this is a pretty competitive keyword, and it doesn't even have the term "slide" in it, I think it's a pretty amazing feat to get into the first page. And there are countless such examples. Now you own site might not be able to make it to the first page, but who knows your slideshow might? In that case, you'll be able to drive some second-degree organic traffic to your website. Assuming that you already have a SlideShare account, let's start out by uploading and optimizing a slideshow to take it from being good to great. Like much else these days, you need to do some keyword research before creating slideshows. Now the link applies more to researching topics for blog posts, but the principles are much the same. Try to think of a 3-4 word keyword. And think of 2 or three suitable keywords. Create your slideshow based on those keywords. Make sure you fill out all the fields such as Title, tags, description etc. As always, the title is the most important part. Not only will it become the <title> tag, it will also be your slide's URL. So make sure you use at least one of your keywords properly. Use as many tags as possible that are related to your keywords. And again, for the description, try to use all the keywords you thought of before. This might sound obvious, but try to use as many links to your site within the slides as possible without seeming too obvious. Don't stuff the links in, but don't let go of a good opportunity either. The more the relevant links, the more referral traffic you'll get. Share like crazy on the first day! 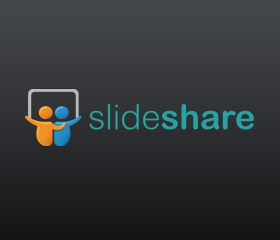 If your slideshow gets a lot of shares and views on the first day, SlideShare will feature your slideshow on the first page. Now it doesn't take a genius to figure out how beneficial that could be. So before you upload your slideshow, make sure that you're ready to share it immediately. Upload it in the starting hours of the day, and ask your friends to share it as well. Make use of social media. This word-of-mouth marketing will only be for the first day, but if it gets you featured, it'll do a lot of good. For the same purpose, share the slides on your own website. Embed the slideshow in a post, and share it with your readers to get additional views to the original slideshow on SlideShare. Remember: the more the views, the better the chances of getting featured. Always add a professional looking photo (and you alone) as the display picture. Complete out your personal profile, and don't forget to add personal link that SlideShare allows you to add. It can be a link to your website. While not a dofollow link, it can still bring in some referral traffic. that is what we need in your blog as always really like the your have explain. Thank you very much for a such a nice articles. great article as always, and honestly i didn't know that we can actually use SlideShare for new traffic! FYI , the Clickable feature is disabled by Slideshare . Even if it gets featured, we will lose traffic because of this. Sad. Thanks Bro.Thanks For Your Valuable Tips And Tricks About This Article.I have Enjoyed More A Lot.I Have Bookmarked Your Website.I Wish You To Achieve Great Succes In Your Blogging Life With Your Blog. Media.Net is better than Adsense Why? My Blogger Tricks is unfair!!! They said that if we'll comment along with links in the comments, then it'll be considered as spam and will be removed immediately!!!! They even removed 1 of my comment!!! It is unfair because on this post, I'm noticing that readers are commenting with links pointing to their blogs and they are not being removed!!!! Mustapha Brother, please see into the matter urgently!!! Thank you very much borther.... This will be a great guide. UP Police Jobs Recruitment. You've made a nice article It was really helpful to me, Hope I'll get more stuff from here on the same subject for a good success of the Blogging. I really appreciate the efforts of you concerning everything that you give us here. Thanks for sharing such a great ideas with us. Very informative tutorial about getting traffic with the slide share tools for both newbies and experts to adorn their blogs for the upcoming gala days. kindly throw more light on that so that one can follow accordingly. Fortunately, the "butter generation" having governed by only consuming from the oil and gases none of them participated in developing, will be out after the election at the end of September this year. What a huge article with lot of useful information for bloggers and it was a must read article for every blogger.